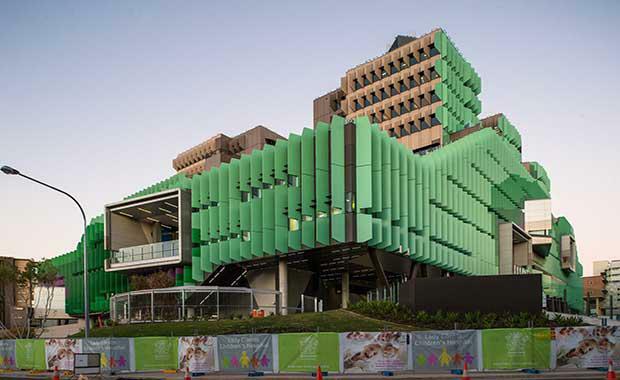 Dubbed a ‘super hospital’, it now forms a new major landmark for Brisbane, connecting with South Bank precinct, Somerville House and Saint Lawrence’s College. Project Director Bruce Wolfe from Conrad Gargett said the hospital took seven years to build and expressed excitement to see it fully operational. “We’re very excited to see the Lady Cilento Children’s Hospital, which was seven years in the making, become a fully operational children’s health campus,” Mr Wolfe said. Children’s Health Queensland Chief Executive Dr Peter Steer said the complex design of the hospital has been successfully delivered. “The contemporary design we envisaged several years ago has been delivered and will allow us to achieve our goal of delivering patient and family-focused healthcare,’’ Dr Steer said. He named stakeholder engagement as being fundamental to the project and a key contributor to its success. “Considering the community vision has been key to the project’s success and an aspect where I think the intent of the architects has lived true,” Dr Steer said. The Children’s Hospital has seen staff and services from two hospitals come together in the new 359 bed tertiary/quaternary design to deliver quality paediatric care to Queensland. The hospital design’s layout is reminiscent of the structure of a tree with a ‘trunk’ and ‘branches’ that provide vertical and horizontal linkages uniting diverse cultures and creating an engaging community environment. The design provides easy navigation and access to natural light, fresh air and landscaping to promote a healing environment. The landscape architecture has had a major influence on the design. The hospital is equipped with extensive sun shading with purple and green blades that reference surrounding nature. There are transplanted 30-year-old fig trees, play areas and numerous roof gardens for recreation and rehabilitation. The design won the Future Health Project Award in the Design & Health International Academy Awards last year.